Clapping my hands like a little kid!! I love myself! 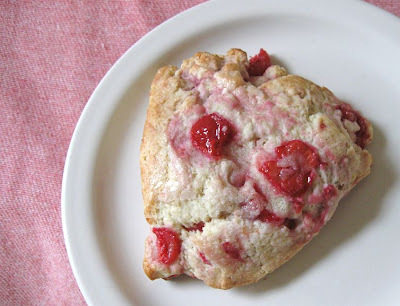 Sour cherry scones. The only way I would be happier is if someone made them for me, still using this recipe. No. No, no, no, no. I want to make them. That makes me happiest. Yep, yep, yep. I wanna bake for the world, feed my spirit. This is one of those things that ups my challenge of resisting more than one...I like eating these quite a bit. 1 c. whole frozen sour cherries, not thawed. After measuring, slice them. In a separate small bowl, beat egg until nicely loose, add vanilla, add cream. Set aside. Mix flour, baking powder, sugar, salt in a mixing bowl. Cut in butter. Either by hand or mixer with a paddle attachment. Add wet ingredients, mix until almost combined. Add the frozen cherries, mix just until incorporated. Remove to a floured surface. Pat to a height of an inch or more. Cut in six wedges. Brush tops with cream, sprinkle with sugar. Bake at 400 degrees for 18-25 minutes, depending on the cold status of the frozen berries, how dark you like your scones. Touch them in the middle, they will spring back when done. Lovely scones! Very festive with those red cherries.